You Are Here: Home » Feature » Black Teen Denied Scholarship Money a Week Before Graduation… For Being Homeless! KALAMAZOO, MICH. — Zaviona Woodruff, a brilliant high school student, worked hard for the Kalamazoo Promise – a scholarship guaranteed to every student in Michigan who studied in a Kalamazoo Public School from kindergarten through 12th grade. And she always maintained high grades, so she would be eligible. But officials decided that she does not qualify for the scholarship that she dreamed of because she had been homeless for six months. 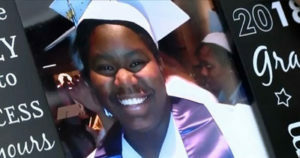 She graduated with high honors and a 3.57 GPA from Loy Norrix High School, a Kalamazoo Public School, in June. She dreamed of studying Mechanical Engineering at Oakland University in Rochester Hills, Michigan through Kalamazoo Promise, wherein free college education would be given to every student who could pass all its three requirements. Woodruff thought she passed all the requirements because she graduated from Kalamazoo Public Schools, was continuously enrolled in KPS, and continuously resided in KPS district for all of her high school years. But she learned a week before her graduation that the Kalamazoo Promise had not been kept on her. The reason? In 2016, two years from high school, she apparently lived outside of the KPS district when they had to move into a shelter for six months. Her father, Cecil, also wasn’t aware that they moved into an apartment in the Comstock School District, just outside the border for the KPS District. Woodruff was crushed but she did not waver. She is now working two jobs while waiting for the committee’s decision. A GoFundMe page has also been started to help her attend college, and so far, she has raised more than $14,000.